Here is a great Planet Hunters story from Rebekah and Jennifer Kahn. My sister and I are spending an entire week listening to and speaking with some of the top researchers of exoplanets. There, among the names of such renowned scientists as Batalha, Borucki, and Charbonneau from NASA and large universities, are Jennifer and Rebekah Kahn, undergraduates from small, all-women’s Smith College – registered participants! And as we take part in the international Kepler & K2 Science Conference, we think about how we got here and know that it all began with Planet Hunters. Twin sisters born in China, we came to America when we were adopted at one year old, growing up on our eastern Connecticut farm, loving baseball, decorating the Revolutionary War graves just beyond our stone walls, and learning the constellations so brightly visible in our beautifully dark night sky. We were normal, healthy kids, except for our teeth. We each had two major dental operations in our very first years’ home and probably hold a world’s record in orthodontics, wearing braces from age 8 to age 17. All this required very frequent trips to specialized dentists in New Haven and Yale. Our dad, trying to make those visits educational if not enjoyable, each time took us to another Yale museum, library, or exhibit. The planetarium and observatory were our favorites (or second favorites, next to the collection of harpsichords that we were actually allowed to play). We became regulars there, looking through the telescopes, seeing each new show and exhibit, and gratefully receiving gift books from Heidi, the administrator. It was a cold, clear January night in 2011 when the Yale astronomer assisting in observing asked us if we would be interested in becoming part of a new research project called Planet Hunters. A research project? Open to kids? We were ready the moment he asked. The chance to do “real” science and not just study it was exactly what we wanted – but of course, as we learned, first we had to do a bit more studying. You see, at age 14, like so many other people, we had never heard of exoplanets. While we had read science fiction stories, we did not know that 51 Pegasi B had made them a reality. So, Planet Hunters taught us about transits and light curves, and that led to transit depths, which then led to M dwarfs and the different star types, which in turn led to the Hertzsprung-Russell diagram, and then the effects of starspots and even eclipsing binaries. Taking part in Planet Hunters was not just our first chance to be “real” scientists (who were convinced that we would be the first to find another Earth), but also an immensely instructive project that made our education as painlessly distracting as our father had hoped our Yale visits would be. While we were too shy to participate in the on-line discussions, we read them avidly and learned much. Two years went by and, as home-schooled high schoolers still entranced by exoplanets, we were accepted into a distance learning “Computational Astrophysics” course from Dr. Laura Trouille (now a co-PI of Zooniverse) of Northwestern University, which published our term project Towards Eta sub Earth. Then as college freshman we spent the summer working on the Wesleyan Transiting Exoplanet Project for Prof. Seth Redfield, resulting in a paper on exoplanet light curves from white dwarfs, published by the Keck Astronomy Consortium. And now, as undergraduate sophomores, here we are at NASA Ames Research Center. Jennifer is working with Dr. Jack Lissauer on discovering how varying the eccentricity of uniformly-spaced earth-sized planets in a Hamiltonian system affects the long-term stability of a planetary system, using the symplectic integrator REBOUND. The aim is to examine the nature of planetary system formation over long periods of time. Rebekah is working with Dr. Mark Marley looking at simulated data sets of exoplanet brightness to be obtained by the WFIRST Space Telescope with filter photometry; analyzing the brightness of each planet, and determining how much can be learned from photometry without spectra. The goal is to enable successful exoplanet characterization without a spectrometer flying on WFIRST, due to budget constraints. We are both exercising our programming knowledge at the moment, modeling the processes and then varying the inputs to better understand the results. We will be developing posters for later presentation and possibly short papers. It is challenging and interesting work and we are doing a lot of late night reading to make sure we get it right. Back at the conference we note that there are a significant number of talks discussing the pipeline and processing of Kepler data. Basic difficulties of SNR and PSF have led to applying advanced methods such as MCMC and ROBOVET. Yet all of these are simply designed to improve the extraction of light curves with less error; all are attempting to decide whether the data indicates an exoplanet or an artifact. That is exactly what we were, and are, all trying to do at Planet Hunters. If imitation is the sincerest form of flattery, then the talk by Prof. Ian Crossfield on crowd-sourcing K2 data interpretation through his “Exoplanet Explorers” project is very high praise for Planet Hunters, which it so closely resembles. While we ourselves have not been active Hunters for a while, we are proud to be part of a project which has enabled citizens to make important discoveries with published papers, two Chambliss Award winners (we haven’t run into Daryll LaCourse who is supposed to be at this conference), and even gained some popular fame (or perhaps notoriety) through the possibility of aliens revealed in Tabby’s Star. To be honest, we are not “natural” STEM scholars and sometimes think we should be pursuing our harpsichord studies rather than exoplanet research. We struggle with the concepts and work long hours to make clear our research goals, but the importance of the quest outweighs our challenges in pursuing it. While we didn’t discover Earth 2.0 when we were 14, we truly believe that we will be part of that discovery in our lifetime. And, for us, it all began with Planet Hunters. I am sorry to report that Gerald Green passed away on Wednesday Aug 16th. He was an active contributor to the Planet Hunter project and a co-author on two key papers (Boyajian et al. 2016, Wang et al. 2015). Our thoughts and condolences go to his wife, Barbara, and to his family. For those who knew Jerry, I have pasted his obituary below, written by his youngest son. Gerald Richard Green, 66, passed away on August 16, 2017. Survived by wife Barbara, sons Will (Patty), Steven (Sara) and Tom; grandsons Toby, Cormick and Sam; brothers Ray Green and Michael Green (Donna); brother in-law Richard Weiss (Patricia Davis) and sister in-law Giudi Weiss. He married his high school sweetheart and loved her for 50 years. He gave Barbara everything good and beautiful in her life, including their children, their home, and a love of plants and animals; key deer and Key West. For her 50th birthday, he gave her butterflies that have maintained a presence in their lovely yard for the last 16 years. He took care of the people he loved, and he taught his family that you don’t just tell the people you love that you love them; you show them. He taught them not to be afraid and to follow their dreams. He was devoted to his three boys, encouraging them in everything they pursued. He nurtured their curiosities and cultivated their passions. He taught them all to sail and drove them all over the country for regattas, and he never missed a basketball game. He bought one of the first home computers, a TRS-80, when Will was born, and he was determined to make sure he knew how to use it. He gave Steven his love of the outdoors, plants and wildlife. He took baby Tom to his advertising office and took care of his “Itty Bitty Buddy” there. A loving grandfather to his three grandsons, Jerry sent them science kits, flew balsa wood planes with them, did armpit farts and taught them about trains. He was a true renaissance man. Jerry taught himself the nuances of countless topics and skills. He was a sailor, a pilot, a flyfisher, a musician, an astronomer, a computer genius, an award-winning advertiser, an antique car collector, a botanist and a wildlife expert. A past Commodore of the Coconut Grove Sailing Club in 1994, he also ran the club’s sailing program. He taught his children and many others to sail, instilling in them confidence, independence and judgment. As Rear Commodore in 1992, he helped bring CGSC through the aftermath of Hurricane Andrew; during the cleanup, he was elbow-deep in the seaweed that had filled the club’s toilets. He sailed Biscayne Bay with his family on their 30-foot Catalina, Advocation. He skippered them to The Bahamas and single-handedly sailed Advocation from Miami to Key Largo, just to know he could do it. After earning a degree from the University of Florida School of Journalism and Communications, Jerry began his career in advertising as a copywriter and won several ADDY Awards. He then taught himself all about computers and began his second career as a computer consultant, a venture that included support for the Ryan White Program in Miami-Dade County, which helped improve the lives of more than 10,000 people with HIV/AIDS every year. In the mid 1980s, Jerry earned his pilot’s license. In his Beechcraft Musketeer, he flew his family to The Bahamas, the Keys, and the Everglades Seafood Festival. A citizen scientist for the Planet Hunters project, he coauthored more than a dozen published scientific papers, including the two most important papers to come from that endeavor. He was a civic activist and served eight years on the Coral Gables Board of Adjustment; he was instrumental in getting city ordinances passed that improved the quality of living in the Gables. Steadfast in his beliefs, he was an avid critic of politicians whose policies he found cruel and uncaring. He hated bullies and never punched down. A man of few words but many (silly) faces, Jerry’s dry wit, sarcasm and love of corny jokes and puns highlighted his rich sense of humor, which he passed down to his sons. How old could alien civilizations be? Guest post by Sarah Pearson, Columbia Astronomy Graduate student and creator of the Space with Sarah YouTube channel (www.youtube.com/spacewithsarah). Today Sarah is describing her latest YouTube episode. Within the last couple of decades, humans have detected thousands of planets around stars other than our own Sun (exoplanets). The enormous number of galaxies each with billions of stars which statistically all have a planet orbiting them, makes it weird to think that life here on Earth should be the only life that exists in the entire Universe. A question which hasn’t received that much attention yet is: how old could the oldest planetary system be? We know that our own solar system is roughly 4.6 billion years old, which is actually quite young compared to the whole Universe which is ~13.8 billion years old. The Big Bang, mostly produced Hydrogen and Helium, while Earth’s crust consists mostly of oxygen, silicon and iron. This means Earth couldn’t have formed right after the Big Bang. But for how long would we need to wait? To create the elements that rocky planets like Earth consist of, stars in the Universe actually need to first be created and then die to spread elements heavier than Hydrogen and Helium into space. Heavier elements are mostly produced in stellar interiors through fusion and when the stars eventually explode and shed their layers to their surroundings. It takes hundreds of thousands of years for the stars’ material to fully mix into nearby space, and subsequently this material needs to collapse and form new stars and planets. While there’s definitely an observed correlation between the amount of time passed since the Big Bang and the amount of heavier elements in the Universe, astronomers are still having a hard time creating a precise timeline for the amount of heavy elements created at what time. But we do know that something like Earth could not have formed until enough stars in the Universe had exploded, and we also know that this could have happened a lot earlier than when our own solar system formed. One of the most interesting planetary systems astronomers have found in our own Galaxy is Kepler-444 (Campante et al. 2015, ApJ) which consists of five rocky planets orbiting a star which is 6.6 billions years older than our own solar system, meaning that it formed only 2.6 billion years after the Big Bang! While this system probably doesn’t harbor life (the planets are too close to their star to have liquid water), its existence demonstrates that planetary systems could have formed a lot earlier in the history of the Universe than our solar system. This begs the question: how intelligent would alien civilization be if they have evolved for billions of years longer than life here on earth? On the Space with Sarah YouTube channel (www.youtube.com/spacewithsarah), astrophysicist Sarah Pearson answers frequently asked space related questions in 3-6 minute videos. In the 10th paper(!) 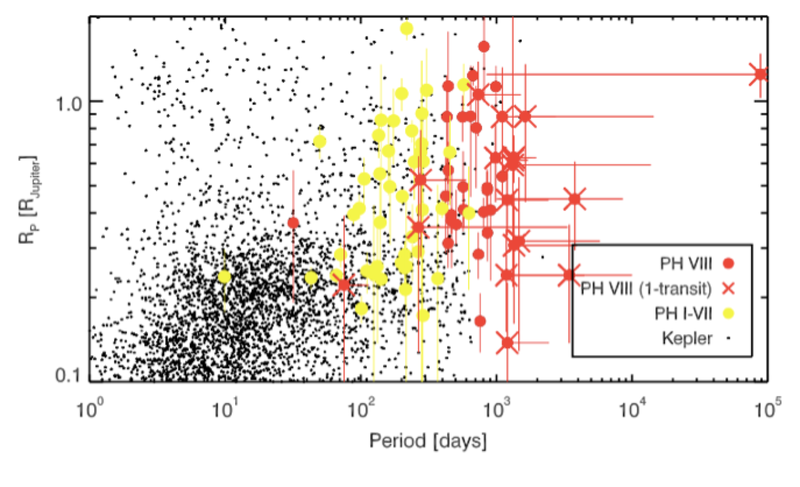 from the Planet Hunters citizen science program, a stupendously great number, we independently discovered 10 new planet candidates in the K2 *Kepler* data (Campaigns 1 and 3). However, simply discovering them was not the main goal of the new paper. We wanted to explore their neighborhoods. The environment in which a star is created has a large and enduring impact on how planets form. Under standard planet formation theory, when a star collapses, it forms a disk, called a protoplanetary disk, due to the conservation of angular momentum. It is in this disk of material orbiting the infant star that planets are formed. Solid material clumps together and forms planets. In the inner disk, the material is hotter, so the only solid material is metallic or rocky. In the outer disk, the material is cooler, which allows molecules like ice and frozen ammonia to clump together as well. This extra solid mass in the outer solar system allows the outer planet to grow bigger and eventually capture gas. Interactions between all these planets can then jumble them around. protoplanetary disk, making one or both stars devoid of planets. Conversely, it’s at least hypothetically possible that, at certain distances, a star could funnel its protoplanetary disk material into the protoplanetary disk of a neighboring star, giving the star more material to make planets out of. Current research has suggested that the destructive effect dominates. We aimed to test this suggestion and to further examine the potential effects of stellar neighbors to planetary systems. 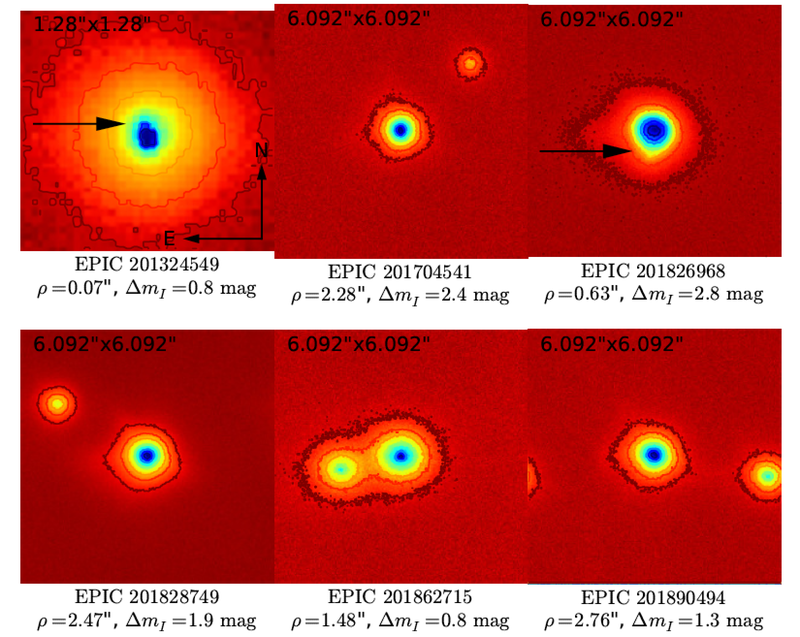 There are similarly interesting questions exploring the effect of a third star in eclipsing binary (EB) systems. we used two telescopes, SOAR in Chile and Keck in Hawaii, that get around this problem. The SOAR telescope uses speckle imaging, which takes hundreds images so quickly that the air doesn’t have time to move around and blur the image and then combines them. The Keck telescope, on the other hand, uses lasers to measure the air turbulence and then deforms its mirrors many times per second to correct the light before it reaches the camera. near very short-period EBs, implying that the shortest period EBs necessarily need a third star in the system. The third star steals energy from the close pair, which pushes those two stars on a shorter and shorter orbit. also looking into if and how we can reincorporate K2 data and, in the future, TESS data. We hope that you continue to contribute to astronomical research. The (not *quite* final) public version of this paper is here. In February 2016, Tabby Boyajian gave a fabulous TED talk on Planet Hunters and the mysterious star KIC 8462852 (a.k.a. “Tabby’s star”). Check her out on this YouTube video, released in April 2016. One other proposed theory is that this pattern of behaviour is due to a fleet of alien spaceships in orbit around a star, a possibility considered by Jason Wright and collaborators here. Jason and co were tipped off about our discovery by the team, and it’s included in their paper as an object with ‘a bizarre light curve consistent with a “swarm” of megastructures’, much to the excitement of much of the internet. ‘Consistent with’ isn’t the same as ‘definitely is’, of course – and personally, my money is very firmly on the comet theory with a side bet on weird stellar behaviour – but until those models are properly investigated alien spaceships remain a possibility. The Wright paper points out this star is now a supremely interesting target for SETI (the search for extraterrestrial intelligence), and we agree – I hope radio astronomers will go and listen for signals. We need more observations of transits in action, too, and will be trying to follow-up to try and work out what’s actually going on.In the meantime, who knows what else is lurking in the Kepler data? Planet Hunters is about finding planets, but this ability to identify the weird and unusual is one of the project’s great advantages. Get clicking at http://www.planethunters.org, and let us know through Talk if you find anything a little odd.